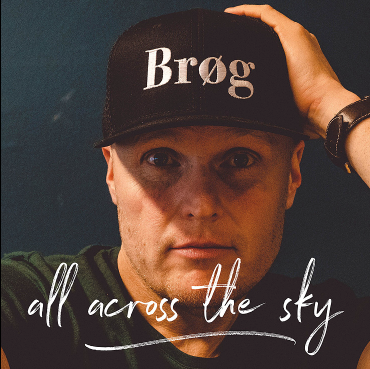 raised || by || cassettes: Music Review // Jonas Brøg "All Across The Sky"
"All Across The Sky" starts right off with vocals and music where you can just feel the melody in it. The music moves with the words and it's so smooth. It reminds me of Prince, Queen, fun. and The Beatles' "Hey Jude". There is this "ah ah ah ah ah" part which really sticks out like "Hey Jude", but overall this is just a fun rock song with elements of pop in it. If you're feeling like this in influenced by The Beatles though, you might also feel like the idea of writing someone's name across the sky is more like another song by them, but I do feel this has that sound where it could be from the "Across The Universe" film. There is also this indie movie vibe in here, like something I would've watched from Focus Films that had an actor like Jack Black in it playing a serious role. But there's no one to catch us when we fall"
There is such an upbeat feeling to this song- it has those walking on cloud pop melodies- but yet even with the line "All that's left to say is goodbye" it still has such layers to it, not just within the lyrics but the music itself. I don't use this genre as much as I'd like to, but I feel like so much pop music is one dimensional and that's fine (I dig catchy music when I'm in the mood) but this particular song feels like complex pop which is a whole different experience that I would like to hear more of in general. Perhaps one of my favorite aspects of this song as well is that much like the artists previously named which I compared it with (especially Queen and The Beatles) there isn't really a feeling where you know what an album by Jonas Brøg would sound like exactly. Sometimes you hear a song that's country, for example, and you just know if there's an album you're getting twelve tracks of country. But if Jonas Brøg is capable of exploring genres just within this song like this then on a full length I firmly believe that the sounds would know no limits.